Kids & communities have a right to breathe clean air. Clean School Buses can help! That’s why LCV’s Chispa is launching the Clean Buses for Healthy Niños campaign. We’re collaborating with national and state partners to fight diesel pollution by using clean school buses that run on electricity. 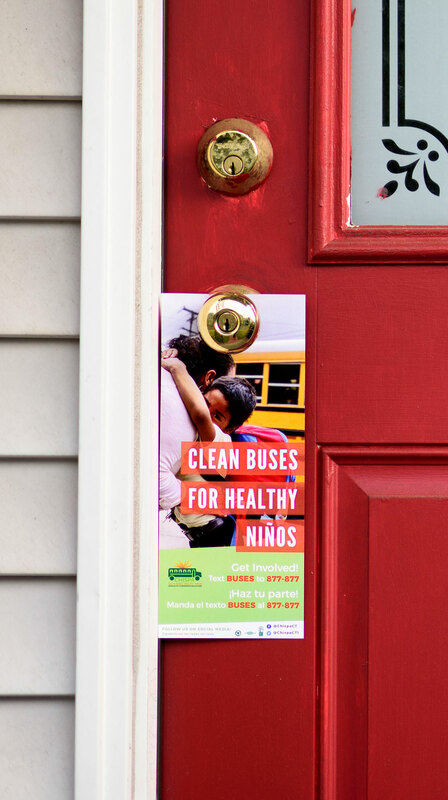 Through grassroots community organizing, we’re calling on governors to put the health of our kids and communities first by using their state’s Volkswagen Environmental Mitigation Trust for clean electric school buses. In short, VW cheated federal emissions tests and polluted the air we breathe with toxins emitted by diesel vehicles. These toxins increase respiratory illnesses like asthma and speed up the rate of climate change. Now, VW is on the hook for $14.7 billion dollars for putting profits over people. States can use $2.7 billion from that sum for electric school buses. Clean Buses for Healthy Niños asks that governors reinvest the VW dollars in our communities and school districts. We’re especially focused on bringing these dollars to low-income and communities of color where students and families are most at risk of breathing dirty air and disproportionately carry the burden of pollution. That way, our states can take dirty diesel buses off our roads and replace them with clean electric buses, protecting our most vulnerable. Sign the petition to your governor asking for clean buses and text BUSES to 877-877 for more details. For more, follow the campaign on social media with the hashtag #CleanRide4Kids and check out our coverage in the media. Launched in 2014 by the League of Conservation, Chispa is unique in the environmental community. The Chispa approach is one of Latinos putting solutions on the table and making community’s political power seen, heard and felt by decision makers. We’re working across the nation and in the six states – Arizona, Colorado, Connecticut, New Mexico, Nevada, and Maryland – where Chispa programs are underway. We’re committed to building powerful Latino communities whose environmental voice cannot be ignored.